A new website has been launched that aims to take the hassle out of buying thermal transfer ribbons and roll labels, while offering the best possible prices and quickest delivery, within the UK. ALS Labels Ltd, the consumables arm of labelling machinery company Advanced Labelling Systems Ltd, has recently re-launched its label and ribbon website,http://www.als-store.co.uk/, to incorporate a greater range and with ease of use in mind. ALS sell thermal ribbons and labels for more makes and models of thermal transfer printers, print and apply engines and thermal coders. Zebra …. and more to follow soon! 3 Simple Steps Makes Selection Easy! With so many manchines on the market, each requiring the ink coating to be wound specifically either inside or outside, some with core and roll size restrictions, selecting the correct specification of ribbon can be a little daunting if you are unsure. Therefore the new website, http://www.als-store.co.uk/ features a useful 3-Step selection process, to help users find the right ribbon, by simply entering the make, model and grade they need. 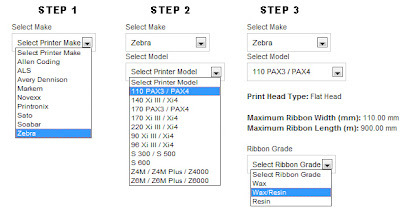 The website then lists all relevent ribbons that will fit the user’s machine and present options such as the original brand ribbon and a quality ALS branded compatible. For all ribbon sizes, live stock levels are shown, many available for immediate next-day despatch. Payment is safe and secure, handled by PayPal so users can use their account or just opt to use any standard major credit card. There are good reasons to buy genuine, manufacture branded ribbons, such as peace of mind, print head warranties and company quality standards. However, a good quality “compatible” ribbon, from a reputable manufacture is definately worth consideration. A word of caution though, like everything in life, when selecting a compatible ribbon to your printer manufacture’s offering, there are good, bad – and then awful. So, as a maachinery manufacture that needs to offer print head warranties themselves, ALS had to select a reputable, consistent manufacture of quality thermal transfer ribbon. One such company is Armor, a French company and the largest manufacture of thermal transfer ribbons in the World. Its no secret that Armor make the branded ribbons for most of the main thermal transfer printer and coder manufactures, so you can be assured that the quality is the best. ALS is proud to sell both genuine branded ribbons from the likes of Zebra, plus high quality compatible ribbons from Armor and other specialist suppliers. While the new web site will often provide the user with a choice, one thing the user won’t get is a product that pretends to be something it isn’t! If its a genuine Zebra ribbon you order – that’s what you’ll get. For anyone seriously considering changing their supplier and want reassurance that the products are right for them, ALS will gladly supply sample rolls. ALS realise that not everyone likes dealing through faceless websites, so if there is something you would like to discuss or enquire, the phone number is displayed big and bold at the top of the screen, which dials straight through to the sales department in Thame, Oxfordshire – and no annoying automated message options! Call them on 01844 264835. Despite material price increases that have been occuring across all manufactures of thermal transfer ribbons, and labels, ALS is convinced their prices remain competitive and to start the year off even better, they are offering a further 10% discount off all orders during January and February. Click here to obtain special discount code. ALS don’t plan to stop there, expect to see that ribbon range increasing to support more makes and models, plus the introduction of a Print Head Shop and an industrial inkjet Ink Shop. Sounds like 2011 will be a busy year!